According to the Bet at Home Sports site, there are over three million players signed up. They promise excellent customer service, great entertainment and plenty of cash prizes. While primarily a sports betting site, there is a lot of different games available too. The company is constantly looking at ways to improve the betting experience and keeps its range of offers and promotions regularly updated. It has to be said the design isn't that appealing to me but that isn't the most important element to a sports betting site. There is literally hours of entertainment offered on the site. You have a choice of scratchcards, table games, classic and video slots, video poker and instant games. There is also a live casino which really enhances the online experience. Live games include Hold’Em, baccarat, roulette and blackjack. 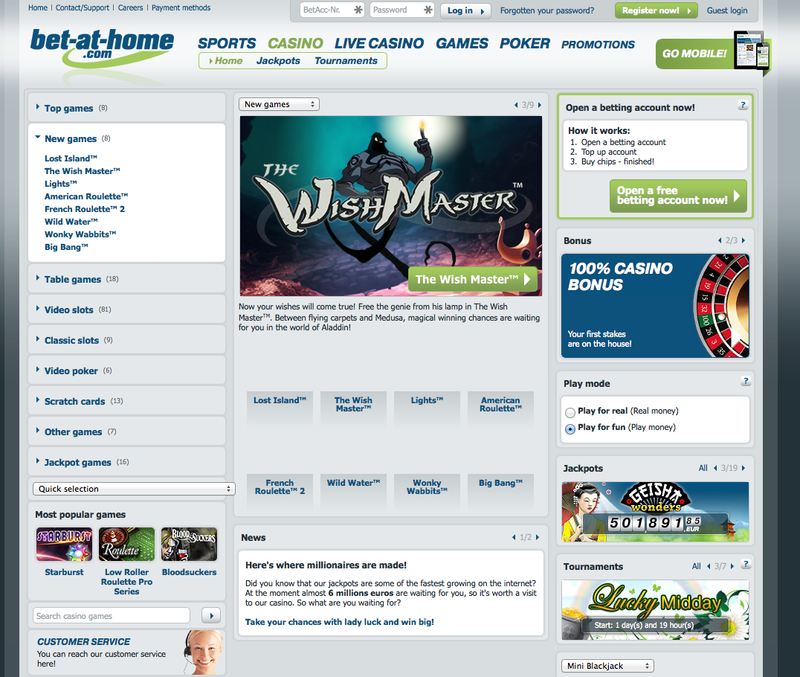 There is also a separate section of the site dedicated to poker tournaments and games. The tournaments offer much larger cash prizes than standard games. Net Entertainment software is used on the site. One of the great advantages of this site is the fact it offers mobile compatibility. You can play when you want, wherever you want. The payment options available include Skrill, MasterCard and Visa. Your account details will always be 100% safe thanks to top of the range SSL encryption software. 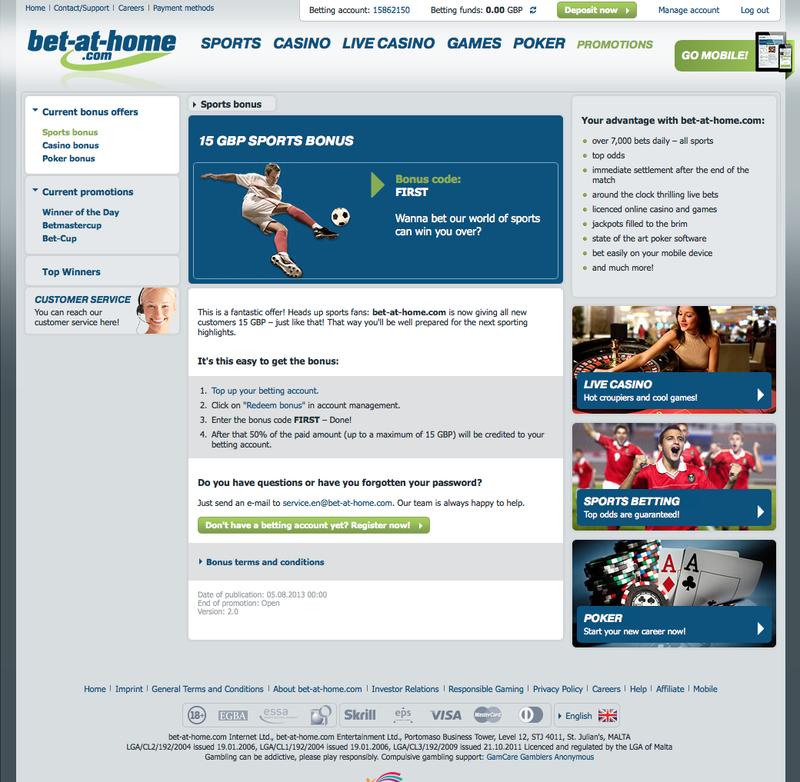 Bet at Home Sports would be a fantastic website if it wasn’t for the simplistic, boring layout. When you look at online casinos and sports betting sites, they tend to feature a dominant black background. This provides a more sophisticated, adult theme. With the Bet at Home Sports site the main background is white and there is a lot of small text. It has a rather jumbled design which makes it slightly harder to navigate through. The style of the site could definitely be improved upon. Bet at Home Sports is based and licensed in Malta. Sadly due to the poor design of the site, Bet at Home Sports doesn’t draw you in. It doesn’t have the most welcoming, exciting feel. It is a shame because the amount of games and even the live casino experience is fantastic. If you can get over the amateur, basic design then it could be a great site to play on.